When we build Plastic SCM, we add features asked by users, customers and our internal timeline, so there are some features that we have no time and resources to do. Luckily thanks to the community, we have been able to develop more plugins and features to it. One of the ways of extending Plastic SCM is by using CmdRunner, which is is an automation layer built on top of the command line. It's built on .NET using C# and is publicly available on our Github repository, so you can fork and contribute. Plastic SCM's command line has parameters such as --machinereadable and --format, that allow us to customize the output of the tool, so that it can easily be parsed by external tools. The plugins for Eclipse, IntelliJ, TeamCity, Hudson / Jenkins, Crucible, Bamboo and others, are entirely based on the command line client, so there are a lot of expansion possibilities. Just before we start: These samples require a working Plastic SCM client installed on your machine. You can get a free license (valid for up to 5 developers) here. If you are used to .NET's way of launching process, you can see we have abstracted all that logic into a simple, static method, and we recover the output that you would normally get from the standard output. We can do something a little bit more serious, like listing all the repositories available in a specific server. Have you seen how we also handle the different arguments? As a quick note before finishing this section, you can use CmdRunner to launch any other program such as difftool or semanticmerge. If is available in the PATH you can call it directly (i.e. explorer); otherwise you can call it using the full path of the executable. Downloading the last changes in a zip file. If you want to extend it with your own commands, you can fork the repository, that will give you your own repository to sync, and, later, if you want to contribute back, you can do a pull request and your changes will be reviewed and merged back into the parent repository. Important: git-sync requires Plastic SCM 4.2 or higher. CmdRunner, which contains the library. Samples, which contains all the samples that are explained in this document. All the samples have their own main method, so you just need to go to the project properties on Visual Studio and select the sample to execute. 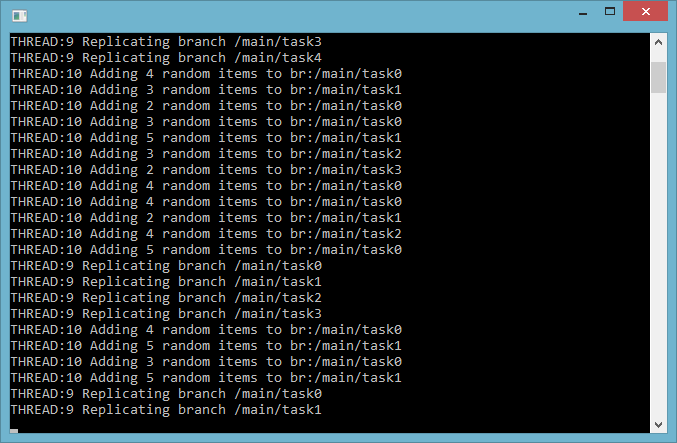 In this sample we are going to list all the branches available on a repository. For more info about cm find, please check out this guide. After that, and using our sample helper, we parse and convert that output into a list of strings with the method GetListResults. Finally, for each element we generate a new Branch object. This object has now the information of the name and the server, and an equal override that can help us to compare branches in the next samples. We can extend this information with all the parameters we can get from cm find. If a new branch is created on the target repository, the name will be displayed at the end. After the command is completed, the result is parsed like in the previous sample, creating a new ReplicationResult object with the result of each operation. The replication result contains then the number of replicated items, and the associated branch. This could be extended with the rest of the items displayed before. Following the previous example, we will now track changes on a branch, so we can replicate it from one server to another. For this scenario, the code will simulate changes in one repository, so we get the notifications in the other one. The first thing we need to know if there are new branches, so we find the branches on both servers, and add the ones that are only on source. The next step is to find out if any of the common branches has changes. For this process the easiest option is use cm find once again. Clicking on the balloon will launch the replica process. For simulating work on other repository, there is a background thread adding items continuously and checking in, so you can just watch as the changes start showing. For this sample, thread number has been added: in the image thread 9 is the main thread and thread 10 is the background one. In this sample we show how to convert Plastic SCM into a Dropbox-alike tray app, by tracking local file changes and commiting them automatically. One of the causes of Dropbox's success is the simplicity and the few user interaction, because most of the work is done automatically and in background. The first thing we need to do is to configure the popout window, and getting the server information for our configuration variable. If we don't change the Configuration code, the IsSimulation, variable will be set to true, and the files will be added and changed automatically in a temporary workspace so we can just sit and watch it happen. 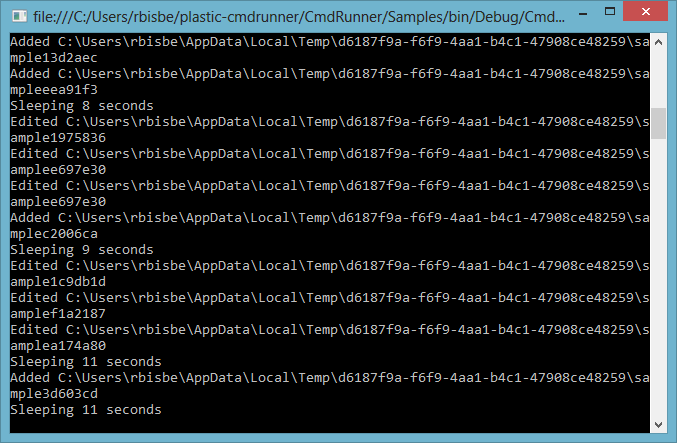 Once we have the configuration, we call, every 10 seconds to a function called CommitUpdates. The first thing that this function will do is to find the existing changes of the workspace, using the command cm status. The generated output is converted to an arraylist as seen before, and each line is parsed into single Change element. The change contains the name of the item (for displaying in the balloon), the full path of it, and finally the change type, recovered from parsing the result. In this sample we are also adding and removing items marked as added and deleted with the commands cm add and cm rm. The notification contains the number of changes that have been checked in and a small description of each one. In this sample we are going to use our source control as a game saver, so each time we change the level a new changeset will be created with the level info, this way we will always be able to recover our previous game status. The game saves the status by creating a new changeset of a random file. The changeset comment contains the game status. This way, for loading the games, we only need to find all changesets, filter by comment, and parse the comment. Each comment will be parsed in a new class called SaveGame, which contains the score, and the color number. That content is later loaded in the game, so you can keep playing in the same status you left it. 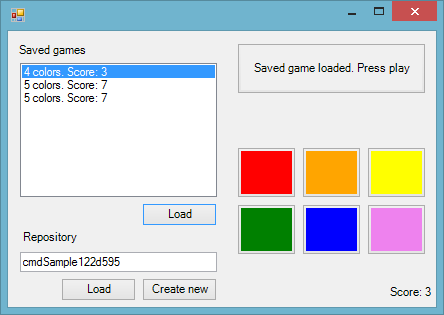 The Load and Create New buttons allow us to create a new Plastic SCM repository for this game, or connecting to an existing repository to use saved games. This tab item allows to checkin files and add a comment. This tab item displays the changesets, and the different changes that were done on each. As we are simulating the behavior of normal usage, the console will output the changes that are being done automatically. We won't focus on GUI related aspects, just in the behavior of three specific buttons, the checkin, the refresh, and the refresh from the changesets view. find changeset (for getting the changesets with a specific format). log (given a specific changeset, we can get the items that have been added, moved, changed or deleted). The process is very similar to others, call the command, parse the result and generate new objects that will allow us to display data in the GUI. The Changeset class is a simplified representation that contains only the id, the date, the comment and the list of changes. It also contains the code needed for parsing the output of a single cm find line. The Item class contains the status and the relative path to the workspace. The Refresh button clears both lists, gets the list of changes and filters added and deleted from changed. It uses one single command from cm: cm status. The operation done is the same GetChanges that we done in the CMBox sample. For adding added and deleted items into the list, just double click on it. The Checkin button will add the items that have been added to the list (added and deleted items), will do a checkin operation of the current workspace status. Finally, it will clear the comment textbox and update the list with the last changes. 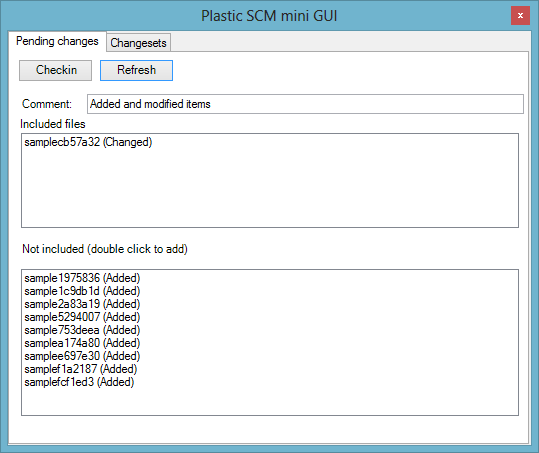 With these few commands we can have our own Plastic SCM client, we would still need to handle errors, merges and a lot of stuff we do internally in the GUI. All the samples shown do individual calls to the cm.exe process, but there is a faster way to archieve results, if we need to make several commands. cm shell repository list workspace delete . 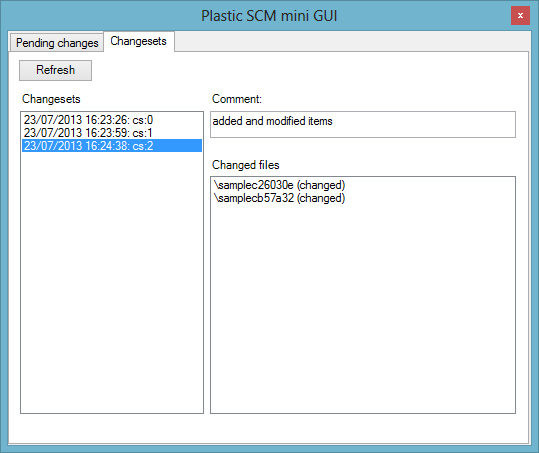 All the code is prepared to run just by specifying a Plastic SCM local server in the Configuration.cs. For the sake of simplicity, all the samples also create a new repository for the operation, so you can try out the code in a secure environment. Creating a repository with branches. Add and checkin of items inside the repository. Add and modify of items inside workspace. Parsing of the output, so it becomes an arraylist of strings. Retrieving the current temporary workspace. This code is open source, published under an MIT license, so you can get it, modify it and customize it to your needs. We also appreciate your contributions, so you are welcome to cloning and pull requesting your own contributions. We replaced the references to deprecated repository administration commands like cm mkrep for their new counterparts.